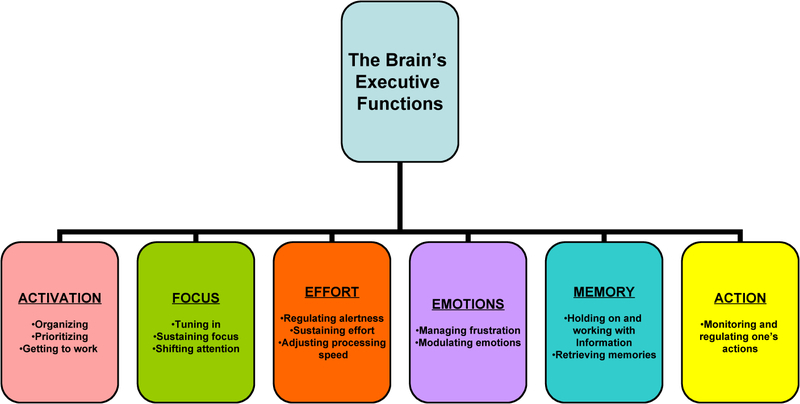 Executive function is like the CEO of the brain. It’s in charge of making sure things get done from the planning stages of the job to the final deadline. When kids have issues with executive functioning, any task that requires planning, organization, memory, time management and flexible thinking becomes a challenge. This may present as the child having difficulties with; making plans, making sure that work is finished on time, multitasking, initiating tasks, applying previously learned information to solve problems, analysing information, and asking for help. The more you know about the challenges, the better you’ll be able to help your child build her executive skills and manage the difficulties. – Have the child take notes during floor/instruction times, that they can refer to when completing the activity. – Give step by step instructions and have the child repeat them back. – Highlight key words and instructions on worksheets. – Allow the child a scheduled time during the day for organisation; for homework, projects and work that needs to be completed. – Use time as a measurement for setting activities e.g. We will work on this until 10:00. – Encourage the child to self talk and ask; What am I supposed to be doing? Am I doing it? What is the next thing I need to do? – Minimise clutter and visual stimuli in the child’s workspace. – Use graphic organisers, thinking maps and mind maps to provide visual prompts and to help a child organise his/her thoughts, especially when introducing new material. – Provide visual checklists to assist the child with getting themselves organised e.g. things to get out of the school bag in the morning. If you suspect your child has difficulty with executive functions or would like further advice, please contact your OT or give Kid Link a call on 9879 7019. ‹ Top tips for staying cool & calm over the holidays!